The queen of Disney Castle, also known as Queen Mickey, Her Highness, or The Queen. She was in charge of the kingdom in her husband's absence. Queen Minnie found Donald and Goofy in the palace courtyard talking about an urgent secret. She learns about the King's disappearance and reads the letter he left behind. Although worried for her husband's safety, she asks them all to put their trust in him. She thanks Donald and Goofy and delegates Jiminy Cricket to chronicle their travels. She wishes for their safe return and asks them once more to help the King before they leave. She appeared again at the end of the game when she saw Huey, Dewey, and Louie back at the Castle. 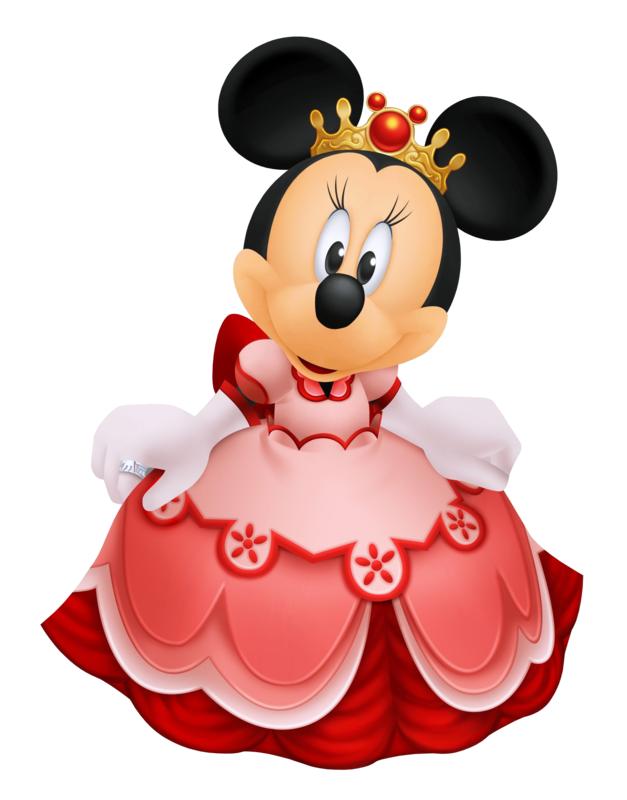 Minnie is wife to King Mickey, making her the Queen of Disney Castle. She is the one who appointed Jiminy Cricket the role of royal chronicler, and sent him along with Donald and Goofy on their journey to find the Key bearer of the Realm of Light. Loyal to both her husband and her kingdom, Queen Minnie does her best to keep the castle running in the King's absence, yet it becomes apparent soon enough there is only so much she can do when the evil witch Maleficent begins an invasion from a rather unlikely direction. 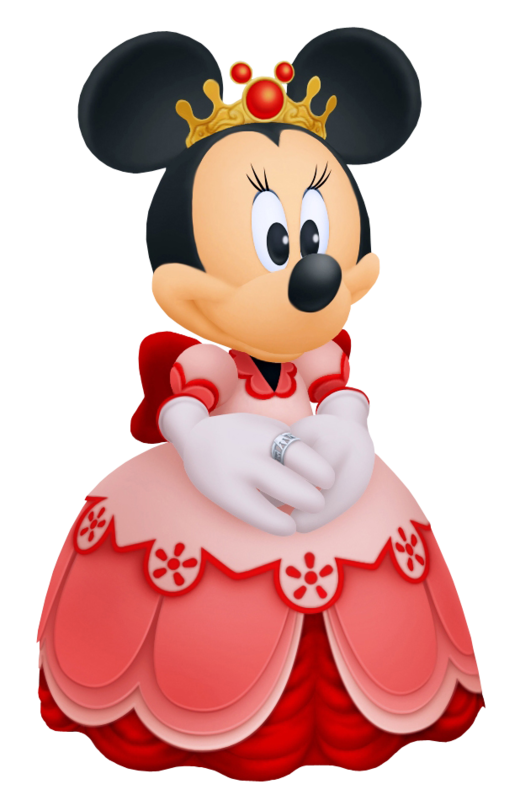 Not one to give up and run away, however, Minnie fights alongside Sora, lending him both her vast knowledge about the castle and its history, as well as her powers over Light. With the crisis contained, she sends the heroes off with a smile, believing both they and her husband will be safe. The queen who reigns over Disney Town with peace and equality, showing little regard for the highness of her own role, speaking with respect to all. She rules over her world while the King is absent, and when Terra and Ven arrive, Minnie is present to help and instruct them. She runs the Million Dreams Award ceremony, and when the prize is given to Terra, Aqua and Ven, she dismisses to a troublesome Pete once and for all, to the dark realm no less. King Mickey's lovely Queen is one of the sweetest and kindest you'll ever meet. Tasked with the difficulty duty of upholding Disney Castle while the King is away on his frequent adventures to maintain the balance of light and darkness, she remains cheerful and works to the best of her ability. She was graced with not only an unexpected but an unfortunate visit by that of Maleficent and Pete while Mickey, Donald and Goofy were away at the Mysterious Tower overseeing Sora and Riku's Mark of Mastery exam. Unable to defend herself against them, she was quickly taken captive and left only to watch painfully as Maleficent and Pete took over and terrorized Mickey and her friends upon their return. Minnie was soon rescued when a chakram quickly flew out of a Dark Corridor, returning to safety's welcome arms.